This season, The Ultimate Adventure Centre in Bideford, North Devon, saw the launch of their new campsite, Adventure Camping. Complete with a field for tents and caravans, ready pitched tepees and freestanding wood cabins, Adventure Camping as an exciting new venture for Adventure Centre owner, Russ Johns. Already managing the marketing for the Ultimate Adventure Centre, Complete Marketing Solutions were trusted with designing and building a new website for this new angle of the business. The aim: get the site full. 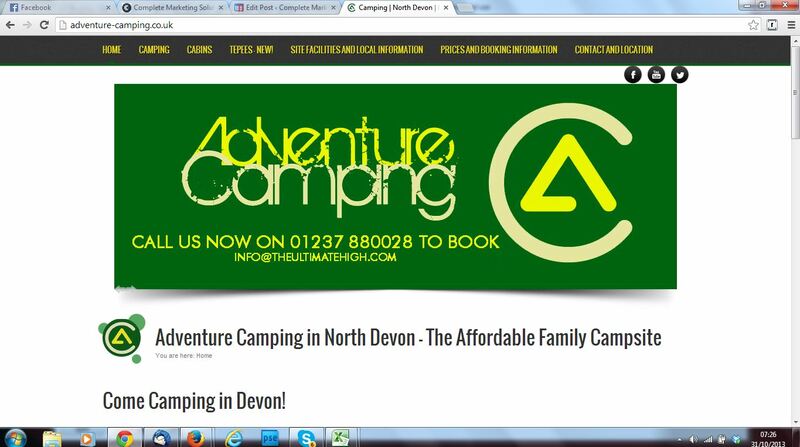 We started completely from scratch to design, write, build and optimise the new Adventure Camping website. The results were phenomenal and saw the campsite being fully booked nearly every night in the season with enquiries coming in for after the end of season, success!